Vacation Bible School is our annual week-long ministry for children age 3 to grade 5, with leadership roles for youth through high school, and plenty of opportunities for adults to prepare and participate. 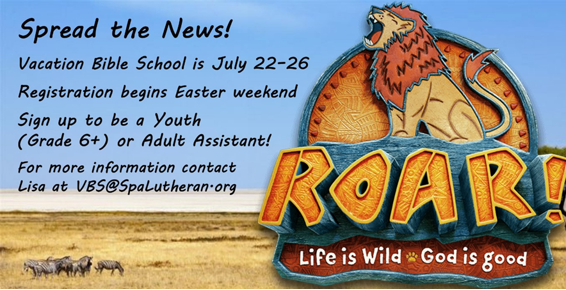 Watch for signup information starting Easter weekend, and email VBS@SpaLutheran.org for more information. VBS 2018 is in the books, with 130 children participating, led by 40 adults and 30 youth. The 2018 VBS theme was Shipwrecked! Rescued By Jesus! Everyone learned that when we are lonely or worried, when we struggle or do wrong, or when we're powerless...Jesus Rescues! The kids brought in over $1700 in coins to support this year's mission Food for the Poor in Haiti, to buy fruit trees and chickens, and to pay directly for meals for some of the poorest children in the Western hemisphere. More information about this Food for the Poor Mission is available here. What do you get when you add 200 children, youth, and adults to a church filled with the love of Jesus? Why Vacation Bible School of course…and an amazingly energetic, fabulous week full of joy in the Lord! 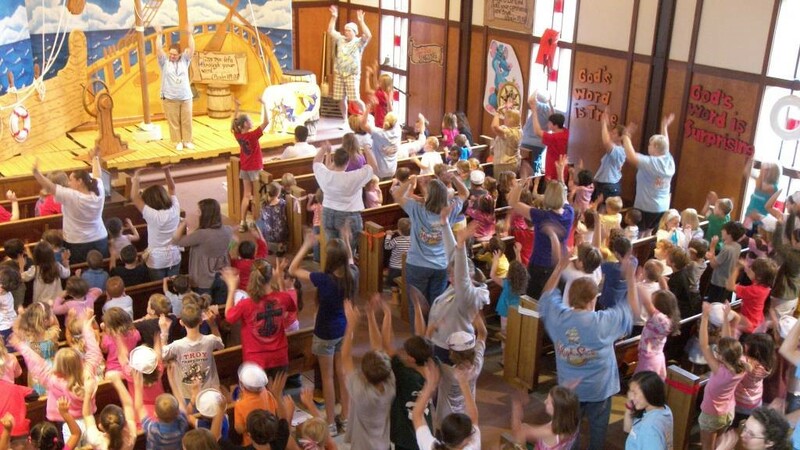 Kids participate 9–12.30 each day of VBS week, starting and ending with large-group skits and singing, and rotating through age-appropriate crafts, snacks, drama, kids' cinema, and music. Our goal for VBS is to provide each child with a week of positive, Christ-centered experiences that will help them grow in faith and build meaningful relationships with one another. Our prayer is that each child will come home from VBS each day with a stronger faith, a big smile, some great crafts and special memories.